Typically in Joseph Campbell’s The Hero’s Journey (monomyth), the hero is called upon to embark on a life-altering quest. After accomplishing each feat of the journey–accepting the call, crossing the threshold, encountering the shadow presence (in Luke Skywalker’s case; his aunt and uncle and the Tusken Raiders). Once the hero passes the point of no return, they enter the world of unfamiliarity, some of which will contain threats (The Empire), some will offer magical aid (Yoda, Ben Kenobi). When the hero finally reaches the mythological belly of the whale, several events can happen, but the one most germane to this discussion is the recognition by the father-creator (father atonement), which Luke does by confronting Vader and helping to redeem Anakin back to the light side by defeating the Emperor. The final step is that of the return. If the powers have consecrated the hero, they now set forth upon returning. When crossing the return threshold, the transcendental powers must be left behind; the hero re-surfaces from darkness; the blessing that they bring restores the world (freedom from the Empire’s oppression and rebuilding the Jedi Order). However, Luke apparently doesn’t do this. So far as we know from Star Wars Episode VIII: The Last Jedi, Luke began to train a dozen students in the ways of the Force at a new Jedi Temple. During his training, one of his students, Ben Solo, the son of his sister Leia Organa and Han Solo, became corrupted by Snoke, a powerful dark side user. Once Ben had gone to the dark side, Luke, on his best intentions, thought it was his duty to stop evil before it grew too powerful, and confronted Ben while in his sleep. Luke hesitated, realizing he was wrong in wanting to kill Ben. However, Ben awoke and faced his Master; murdered half of the students and left with the remaining. In my research, I was not able to find any mythological figures that failed in teaching the next generation. Luke is nothing if not human, Jedi Master or no. He has faults just like any of us. Despite his heroic stature, one of the underlying Star Wars messages is that any one of us can become a hero if we so choose. It can be challenging to learn that the heroes we admired are not deserved to be on the pedestal any more than ourselves. Perhaps Luke is somewhere between an Odysseus or an Achilles and the average individual. Luke is not a god, but a human with the same cracks as anyone. He takes the blame for all the trouble the galaxy is in by The Force Awakens. Luke tosses the lightsaber away because he’s decided to take himself and Jedi out of the equation because he feels they’ve done enough damage. As per Yoda’s advice, Luke did attempt to pass on his knowledge to his students at the Jedi Temple. And yes, Luke failed. Luke’s mechanical hand reaching out to his friend, R2-D2 after Kylo’s destruction of the Jedi Temple. According to Joseph Campbell, “We can have the hero who fails, but he’s usually represented as a kind of clown, someone pretending to more than he can achieve.” Perhaps this statement is more directed to those heroes that failed in their quest. However, Luke is no clown. Luke accomplished his goal of destroying the first Death Star and redeeming his father, Anakin Skywalker. The point I’m making is that when an individual becomes a legend is it because they’ve gone on a heroic journey and have gone on to attain a level beyond the average person. Not all myths go on to become excellent teachers. A great example of this is athletes. Either an athlete is born with the innate talent or ability to achieve greatness, or they’re not. But just because they are talented athletes and put up extraordinary numbers doesn’t mean they can relay their skills to another. Take Wayne Gretzky for example. He broke most, if not every, existing scoring record with the Edmonton Oilers hockey team in the 1980s that it’s highly unlikely anyone will surpass them. However, in retirement, he coached the Arizona Coyotes who never performed good enough to advance to the playoffs. So in this, perhaps Luke wasn’t able to teach those things that made him a person of exceptional abilities because they came naturally to him, in order to keep his students from turning dark? 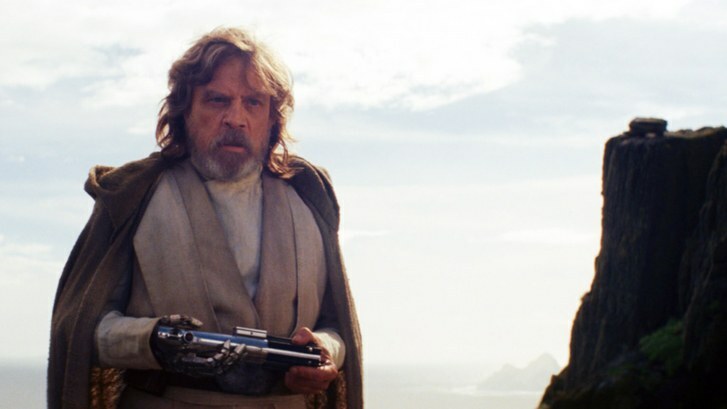 In the end, it was Luke’s heroic deed and self-sacrifice that gave the Resistance the opportunity to escape The First Order and leave Crait. It is Luke’s humanity that makes him that much more admirable. Campbell, Joseph. The Hero With A Thousand Faces. Novato: New World Library, 2008. Johnson, Rian. Interview. http://collider.com/the-last-jedi-luke-lightsaber-scene-explained-rian-johnson/ By Adam Chitwood. 19 Dec.
Hi MelindaI Thanks for the comment. I saw a tweet the other day that equated Luke in TLJ as to having depression after Ben’s turn. I thought that was a good analogy. I wish I remembered who posted that. I also think Luke’s sacrifice at the end gets overlooked. He did come back and make the ultimate hero move.